In 2009 and 2010 the South Lakes path team pioneered the use of sheep fleeces to build a path across Martcrag Moor. Fleeces are laid in a shallow trough, squashed down and a gravelled path surface laid over the top. The wool layer acts as a permeable layer between the path surface and the peat below, and allows the path to ‘float’ above the wet ground, rather than sinking down into it. It’s actually a method derived from ancient engineering techniques for building routes over waterlogged ground. This technique was used on Martcrag Moor to take hikers on a sustainable line around the edge of a very boggy and ecologically sensitive area. The work was carried out by the path team along with the help of Fix the Fells volunteers and National Trust working holidays and a few years down the line is holding up well, with walkers sticking to the path and the surrounding ground recovering from the trampling it was receiving beforehand. As this had worked here, in 2012 and 2013 we used the method again on a nearby path, heading from the top ofStakePasstowards Angle Tarn. This path traversed similar ground, but also included a very deep tarn outflow crossing to build and an old line of stepping stones that had fallen in disuse to remove. This time, the majority of the work was done by volunteer groups. Among these were a couple of working holidays who camped up on the hillside for three nights and worked on the path by the day, completing a large section of sheep fleece based path and also (with the help of waders) building a stone crossing for the tarn outflow which allows walkers to cross but doesn’t hinder the water’s progress. 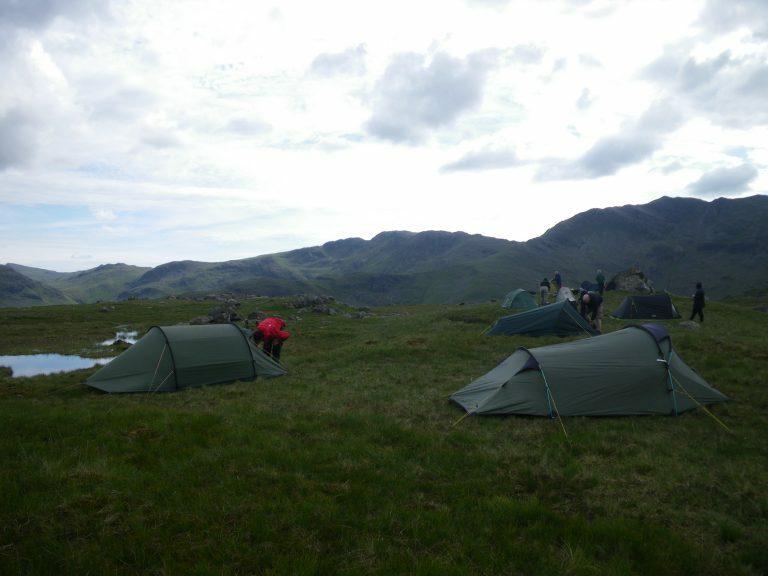 The second, even larger section was tackled in 2013 by the first ‘Basecamp blitz’ working weekend. Brought about by the suggestion of Barry, one of the Fix the Fells volunteer coordinators (himself a regular volunteer), this was a three day work party that worked to remove the line of stepping stones and landscape out the eroded ground around them as well as put in a new sustainable path line using the sheep wool technique. 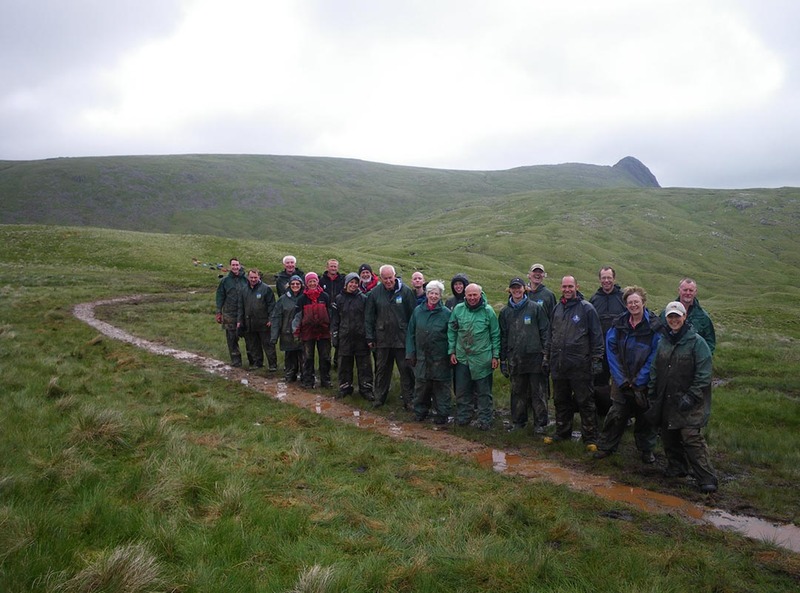 A large group of Fix the Fells lengthsmen worked alongside National Trust staff from High Wray Basecamp and the Southern, Northern and Western path teams to undertake this massive task and after three days of great teamwork had completed the work. One of the beauty’s of this technique was that we did not need to fly any materials in for the job, except for the bags of sheep wool. As these are quite light the helicopter could carry many at a time, meaning only a few trips were needed to the site from the farm in the valley bottom. We also sourced the gravel from ‘borrow pits’ on site, pits dug down to the glacial subsoil and then landscaped back in after the work was finished. Around 50 staff days were taken on the job but with (111) days work gifted by volunteers this reduced the project costs. Additionally, with the Basecamp organising and hosting the weekend it also provided an opportunity for those lengthsmen who live further away to stay over for the duration of the weekend and get involved, as well as acting as a great social get together for the group. This approach was used on the 2014 Red Tarn to Crinkle Crags project.